Sony is set to follow Fujifilm and release a 3D capable point-and-click camera aimed squarely at the consumer market. Sony confirmed it plans to release a 3D camera this week, with Sony's president of Personal Imaging and Sound, Masashi Imamura, telling Digital Photography Review that the company plans to fully integrate 3D technologies in its consumer camera range soon. "Mr Imamura admitted that 3D imaging is an area into which Sony is keen to expand," noted Digital Photography Review. 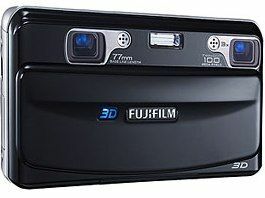 Fujifilm released the world's first 3D consumer cameras, the FinePix Real 3D W1 and FinePix Real 3D V1, back September 2009 - though both received a rather muted reception amongst critics and consumers alike. Sony is set to bring its LX900 and HX900 3D TVs to consumers later this spring and is also soon to release its range of 3D-ready Blu-ray players, in anticipation of a number of triple-A Blu-ray releases planned in for later in 2010.